NASA's engineering design challenge focuses on NASA’s current plans to explore planets, moons, asteroids and comets -- all members of the solar system family. 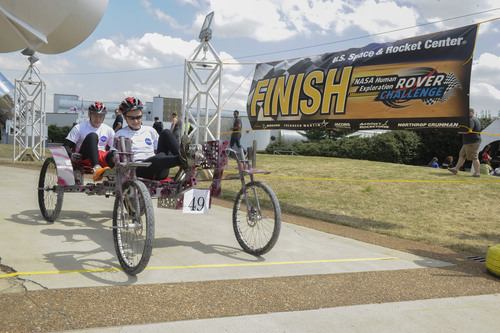 The NASA Human Exploration Rover Challenge will be held April 12-13, 2019, at the U. S. Space & Rocket Center. The challenge will focus on designing, constructing and testing technologies for mobility devices to perform in these different environments, and it will provide valuable experiences that engage students in the technologies and concepts that will be needed in future exploration missions. Rovers will be human-powered and carry two students, one female and one male, over a half-mile obstacle course of simulated extraterrestrial terrain of craters, boulders, ridges, inclines, crevasses and depressions. Each student team of six members is responsible for building their own rover, and the two course drivers must be chosen from the team. As a part of the challenge, and before traversing the course, unassembled rover entries must be carried by the drivers to the course starting line with the unassembled components contained in a volume of 5 feet by 5 feet by 5 feet (dimension requirements). At the starting line, the entries will be assembled, readied for racing, and evaluated for safety. Assembly occurs one time prior to the first course run. The top three winning teams in each division (one High School Division and one College/University Division) will be those having the shortest total times in assembling their rovers and traversing the course. Each team is permitted two runs of the course, and the shortest course time (plus penalties) will be added to the assembly time for the final total event time.